The Lea prides itself on being an inclusive school, where social and cultural diversity are celebrated. We aim to provide an educational environment that nurtures and challenges each child, enabling individuals to flourish and to achieve his or her highest possible potential. We recognise that the partnership between home and school is one of the most important elements in ensuring that a child’s education is a successful, rewarding and happy experience. For this reason, members of staff value the support and commitment which Parents/Carers offer both to the school as a whole and to their own child’s education. We ask Parents/Carers to kindly notify the school by calling the school office and selecting the absence line. This must happen by 9am on the first day of absence, and we ask that you keep the school informed during any prolonged absence. Parents/Carers are asked to ensure that their children arrive at school promptly each day. Late arrivals must be signed in at the School Office. Parents must complete a form for any medical/dental appointments in school time, although this should be avoided where possible. Forms are available from the School Office or on this website. Holidays during term time cannot be authorised by the Headteacher. Parents/Carers needing to take their child out of school during term time must complete a form. Only exceptional absences will be authorised by the Headteacher. Please read our behaviour policy for more information. Parents/carers are invited to attend their child’s class assembly, details of which will be published in the weekly school newsletter. Harvest Assembly takes place in autumn and is led by the Year 2 class – this is where we give thanks for our food and is also an opportunity to share food with others in our community by collecting food donations. The Headteacher hosts regular coffee mornings, to give parents and carers an opportunity to chat informally about any concerns or questions they may have about their child’s education. Meetings are held half-termly in the staff room and will be notified via the Newsletter. It is vital that the school is made aware of any dietary needs that your child may have, particularly if it is a food that the child is allergic to or must not eat for religious reasons. You have been asked this information as part of the New Pupil Information Pack, but it is important to keep the school office informed of any changes. If your child has a school meal, Hertfordshire Catering will require evidence from a medical professional so they can produce an allergy specific menu for your child. Please visit their website www.hcl.co.uk and complete the online application. If you have any questions please call HCL on 01707 292500. The staff and governing body at The Lea encourage children to make the most of their time at school and ask for their co-operation. The Home School Agreement document is part of the New Pupil Information Pack you were sent and we ask parents/carers to read this with their child and return a signed copy. Homework is set to support the children’s learning at The Lea. For younger children, this is generally tasks from our reading scheme. As children progress through the school, the tasks support other areas of the curriculum and are designed to encourage good study skills, with emphasis on reading, spellings, multiplication tables and number facts. In the hotter weather it is important that all children bring in sunhats and water bottles every day. Sunscreen is to be applied before the start of school. (There are a variety of lotions available which are designed to last all day from one application.) In exceptional circumstances, if you require your child to reapply lotion during school hours, please bring it in (labelled) to the school office in the morning. Each child belongs to one of four teams / house colours – Sapphire, Topaz, Emerald and Ruby. Team points will be given to children for good work, good behaviour, courtesy and positive attitude. Children will receive a certificate in celebration assembly when they hit certain milestones: bronze when they reach 25 team points; silver for 50 team points and gold for 100 team points. When they reach 75 points a letter is sent home. A running total of house points will be displayed on the team point board in the hall. The winning team each term will receive an in-school prize (in the past teams have had a bouncy castle hired for them at playtime, a trampolining session, ice creams at break time, etc.). Lost property is located in our reception area outside the school office. 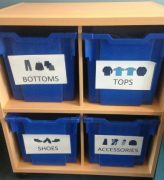 All lost property found in school will be put here. If your child has an item of clothing or footwear missing, please direct them to this unit. Alternatively, parents/carers are welcome to come and look at the end of the day if they wish to. Should your child require medication during the school day, please bring it to the School Office. Parents/Carers must also complete a permission form to allow office staff to administer medicines in school. Forms are available from the School Office or on this website. The school has an ‘open door’ policy and the Head and class teachers are very approachable. Class teachers are able to meet with parents briefly at the start or close of school, or by appointment if a longer meeting is needed. Likewise, the Head Teacher is always willing to meet with parents to discuss any concerns either before or after school if he is available, or by appointment. The Head Teacher can often be found on the playground at drop off / pick up time. Rule 191 – You MUST NOT park on a crossing or in the area covered by the zig-zag lines. To alleviate traffic congestion we have a self-imposed 1-way system that we would like you to adhere to at pick up and drop off times i.e. up Moorland Road, right into Rye Hill and right down Westfield Drive back to Westfield Road. 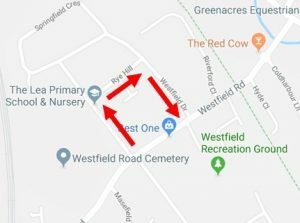 If you do need to drive please consider arriving a few minutes earlier and parking in one of the side roads (Hyde View Road, Masefield Road, northern end of Springfield Crescent) and walking. Our pupils’ safety is our key priority; therefore, we would appreciate your co-operation in parking safely and sensibly. We see education as a partnership between home and school. To this end we very much welcome any parents who wish to play an active role in the school. The class teacher provides an outline of the curriculum their child will be studying at the beginning of each term so parents are aware of what is being taught and can, where possible, contribute in some way. If you feel you have something to offer then please talk to your class teacher. There are also opportunities to be involved by reading with the children, accompanying class trips, running clubs or joining the Lea School Association to help with fundraising. Photographing and / or videoing of children at sports events is strictly prohibited in accordance with Data Protection requirements. We pride ourselves on our happy school environment and the way in which we look after each other. Each Year 6 pupil is ‘buddied up’ with a Reception pupil at the start of the academic year. The buddies meet weekly where they can share stories, catch up on news from the week, do reading, play games or take part in some outdoor learning. This allows our older children to grow in self-esteem and confidence by being positive roles model for the younger children and really helps ease the transition to ‘big school’ for our Reception children by making them feel valued and giving them a friendly face in the crowd. If you do not receive notice from us, you should always assume that the school will be open as normal for all pupils. Each week children from Nursery to Year 6 are chosen by their teacher to be Star of the Week. This can be for many different reasons – good behaviour; an excellent piece of work; understanding something tricky; kindness and lots more. Whatever the reason, the children are always very proud to receive their certificate during Friday’s celebration assembly. The ‘stars’ will also be listed in the weekly school newsletter and on a noticeboard in our reception area. We encourage you to walk to school if at all possible, but if not, to park responsibly and not to block residents’ driveways. Only Year 6 pupils are permitted to walk to school without an adult and we ask parents to put their permission in writing to the school.